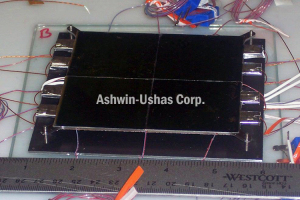 Variable-Emittance Infrared (IR)-Electrochromic Skins for Spacecraft Thermal Control | Cutting Edge Technology | Ashwin-Ushas Corp. | Ashwin-Ushas Corp. 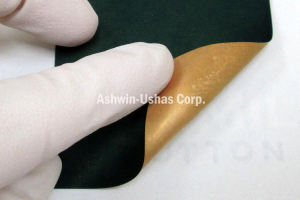 Innovative skins that can control the thermal signature and output (emissivity) of the surfaces they are affixed to. The only spacecraft thermal control technology suitable for use in micro (< 20 kg) and nano (< 2 kg) spacecraft, allowing for much greater flexibility in their design, and eventual democratization of the space industry to allow even small companies to have their own, dedicated satellites. Spacecraft thermal control is an uncelebrated and unpublicized, if essential, requirement for all spacecraft. When facing the sun, spacecraft surface temperatures may exceed +100 °C; when facing away from the sun, temperatures may fall below -100 °C. This can occur within seconds for rotating spacecraft. Emittance (ε) of the spacecraft surface, which takes values from 0 to 1, must be dynamically variable, in the range 0.2 to 0.8 with Δε at least 0.4, hence the need for variable emittance materials. Simultaneously, the surface’s solar absorptance (α(s)) which also takes values from 0 to 1, should be constantly low, preferably < 0.4. Variable emittance materials must also operate under space conditions of high vacuum (< 10-5 Pa), extreme temperatures, solar wind, radiation, micrometeoroids, etc. 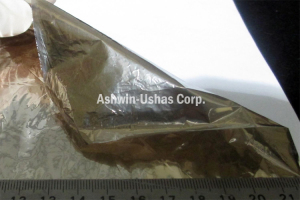 IR-transparent semiconductor-on-polymer surface coating affording very low solar absorptance. 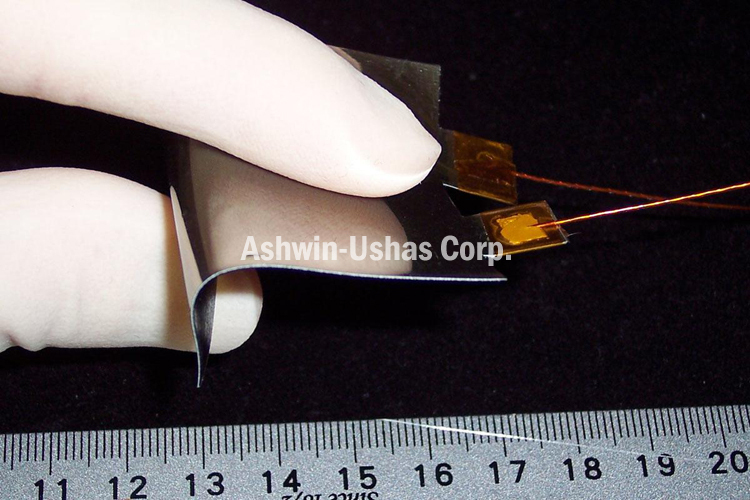 Thin (< 0.5 mm), flexible, very lightweight (0.12 g/cm² or 1.2 kg/m²) skins, cut with scissors to suit any shape/size and area. Can be affixed to any surface. Emittance (ε) variations from 0.19 to 0.90, tailorable. Δε values of > 0.53 (world’s largest published value, to date). Solar absorptance (α(s)) < 0.35, light/dark switching time < 10 s.
Demonstrated durability under extreme space conditions. Very low power requirements: +/- 3 VDC, < 50 μW/cm². 1⁄10 to 1⁄3 the cost of current, extant technologies. Originally developed under NASA and US Air Force funding. Spacecraft thermal control is an uncelebrated, if essential, requirement for all spacecraft. Of the three methods of thermal conduction available on Earth, only radiation is available in space (convection and contact-conduction are inapplicable). When facing the sun, spacecraft surface temperatures may immediately exceed +100 °C; spacecraft must emit internal heat as well as reflect externally incident heat under these conditions. And when facing away from the sun, temperatures may fall below -100 °C; spacecraft must conserve heat under these conditions. This temperature change can occur within seconds for rotating spacecraft. Relevant property is emissivity, which varies from 0 (low emissivity, e.g. white Teflon®) to 1 (high emissivity, e.g. carbon). Emissivity is specific to a wavelength. Emittance (ε) is integrated emissivity over ca. 2 to 45 μm. For efficient spacecraft thermal control, spacecraft should be able to dynamically vary their emittance. Emittance should ideally vary at least by 0.4, in the range 0.2 to 0.8. 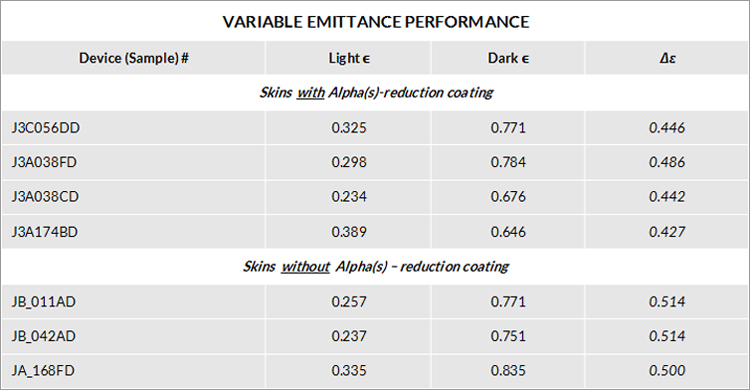 Hence the need for Variable Emittance materials. Simultaneously, the spacecraft surface’s solar absorptance (α(s)), which is a measure of the surface to absorb solar radiation and also varies from 0 to 1, should be constantly low, preferably < 0.4. Additional requirements for Variable Emittance technologies: Ability to successfully operate under space conditions, including high vacuum (< 10-5 Pa), extreme temperatures (at minimum +/- 100 °C), solar wind, radiation and occasional micrometeoroids. 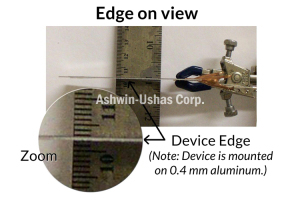 Prior to the development of Ashwin variable-emittance materials, micro- and nano-spacecraft had no efficient means of thermal control, severely limiting their design. Our technology will allow for much more flexible design of these, making it affordable for small companies to launch their own, highly capable satellites, thus “democratizing” space. 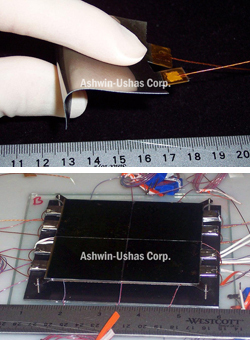 Conducting Polymer (CP) as the active IR-electrochromic yielding variable ε. 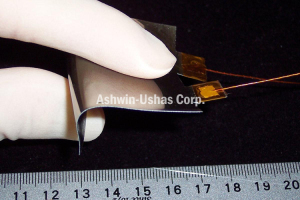 Thin (< 0.5 mm), flexible, very lightweight (0.12 g/cm² or 1.2 kg/m²) skins, cut with scissors to suit any shape/size and area. Can be affixed to any surface. Power requirements: +/- 3 VDC, < 50 μW/cm². “Smart”, space-qualified (rad-hard) Controller for efficient variable emittance control at all relevant space temperatures. Low cost. Huge launch cost savings due to extremely light weight. Emittance (ε) variations from 0.19 to 0.90, tailorable. Δε values of > 0.53, highest reported thus far for any functional Variable-Emittance material. 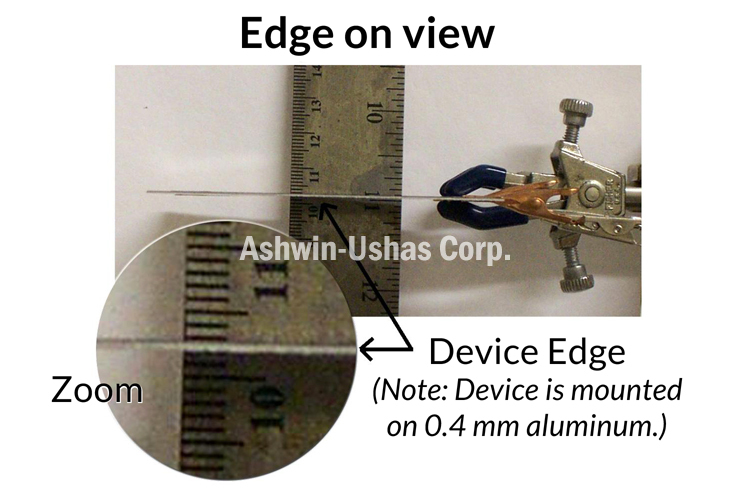 Measurements using emissometer as well as calorimetric thermal vacuum. 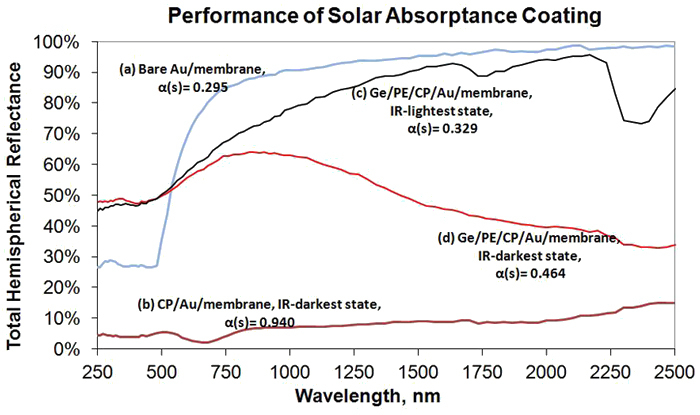 Solar absorptance (α(s)) < 0.35. 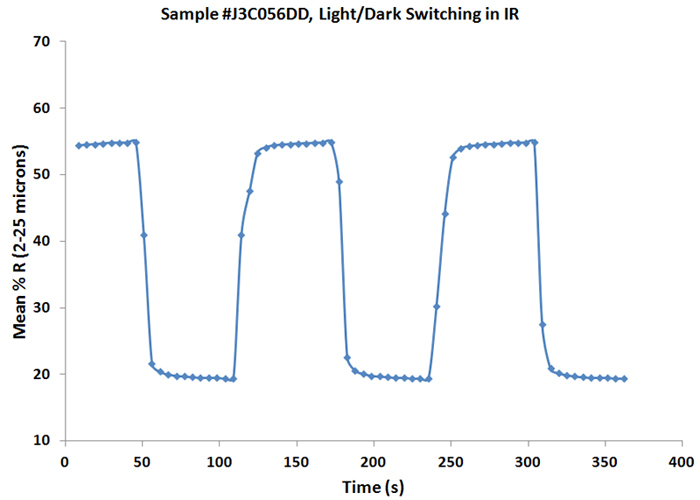 Switching Time, for full switching between extreme light (lowest-ε) and extreme dark (highest-ε) states is < 10 s.
Demonstrated to survive calorimetric thermal vacuum testing with thermal cycling (-40 to +60°C) and continuous light/dark electrochromic cycling over > 7 months under space conditions (< 10-5 Pa vacuum, far-UV). 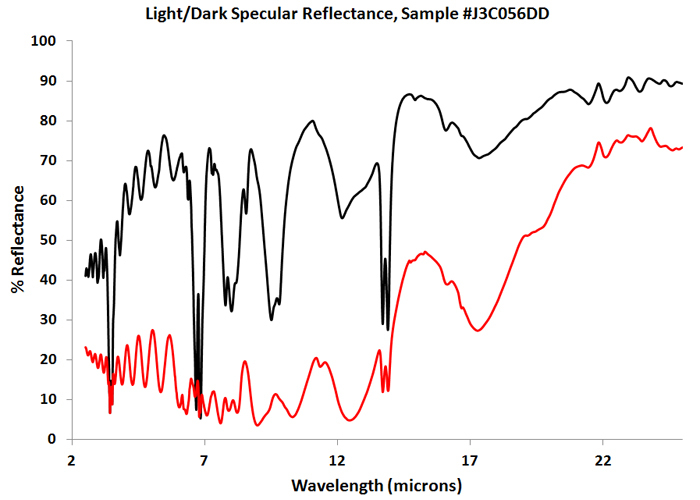 Cyclability: Tested to 10,000 light/dark (low/high emittance) cycles without significant degradation. 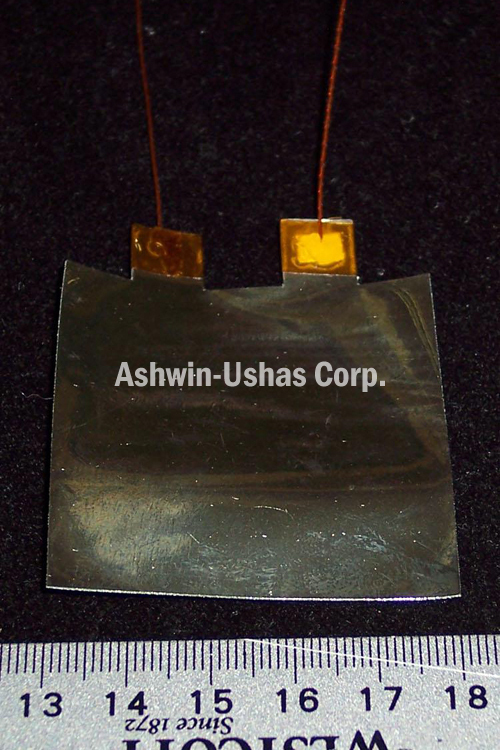 Demonstrated to have excellent durability against solar wind, gamma radiation (7.6 MRad), atomic-O (2.74 X 1021 atoms/cm² @ 10-6 Torr), electrostatic discharge (ESD) and micrometeoroids. Indefinite shelf life in packaging and at storage temperatures between -20 and +50°C. Performance superior to newer technologies such as phase-change materials, microelectromechanical (MEMS) systems, electrophoretic systems, electrostatics, other variable-emittance electrochromic systems (including metal-oxide-based ones), and thermochromics. Performance superior to extant mechanical louvers as well as loop heat pipes and other passive refrigeration techniques. 1⁄10 to 1⁄3 the cost of extant mechanical louvers and loop heat pipes. 1⁄2 to 1⁄5 the cost of other newer technologies described above. Click tables and graphs to enlarge.